Consult PR’s consultative approach with clients stems from our corporate culture that thrives on educating clients on what's possible on the internet, with needs-based solutions and world class customer service at the heart of our firm. Consult PR’s consultative approach with clients stems from our corporate culture that thrives on educating clients on what's possible on the internet, with needs-based solutions and world class customer service at the heart of our firm.We are more than just consultants...we seek to become your strategic technology partner and we have the talent and team members in house to recommend, engineer, deploy and measure all your digital initiatives. No need for sub-contractors and free-lancers, our in-house talent covers the spectrum of technology needs that many prospective clients are seeking to implement. We are quite simply put...a one stop shop for everything web...from websites, to digital marketing (SEO, Social Media, PPC, etc. ), phone apps, custom cloud software/ web applications, PR, book marketing ...and more. We start the process with a free consultation that serves to identify the unique goals and targeted objectives of our prospective clients. We make sure that everyone leaves that meeting with lots of useful information regardless of whether we move forward immediately together or in the future. Clients over the years have complimented us on this process and it’s ability to not only be very interesting, as it serves to demystify and explain in layman's terms how they can begin to position their firm’s digital initiatives for effective and targeted now and into the future, but also empowering and exciting because it is a truly customized approach unlike the cookie cutter, canned solution and templatized approach they are subjected to by other firms. Prospective clients begin to understand the difference between the apples and the oranges as they go through their due diligence in selecting their perfect digital vendor/ strategic partner...and that leads to great decisions and even better results.All of that being said, we never lose sight of the fact that return on investment (ROI) is our clients main focus and as such it is our main focus. We engineer solutions to work and we also can avoid failed initiatives by knowing during test engineering to avoid them from the start ...saving lots of time and money for our clients. Our inception in 2005 was the beginning of our firm's evolution as a premier technology-focused firm that delivers superior results driven solutions to our clients. Over the years, acquisitions of some of the top firms and talent in our space have created the perfect blend of services for our clients to employ to further separate themselves from their competitors. As a result, Consult PR delivers more services and products under one roof to our clients than any other like sized company. Our ability to bring services, once reserved for the largest and wealthiest corporations, to smaller and mid sized clients, has stood us apart from our competition. We start the process with a free consultation that serves to identify the unique goals and targeted objectives of our prospective clients. We make sure that everyone leaves that meeting with lots of useful information regardless of whether we move forward immediately together or in the future. Clients over the years have complimented us on this process and it’s ability to not only be very interesting, as it serves to demystify and explain in layman's terms how they can begin to position their firm’s digital initiatives for effective and targeted now and into the future, but also empowering and exciting because it is a truly customized approach unlike the cookie cutter, canned solution and templatized approach they are subjected to by other firms. Prospective clients begin to understand the difference between the apples and the oranges as they go through their due diligence in selecting their perfect digital vendor/ strategic partner...and that leads to great decisions and even better results. All of that being said, we never lose sight of the fact that return on investment (ROI) is our clients main focus and as such it is our main focus. We engineer solutions to work and we also can avoid failed initiatives by knowing during test engineering to avoid them from the start ...saving lots of time and money for our clients. Our inception in 2005 was the beginning of our firm's evolution as a premier technology-focused firm that delivers superior results driven solutions to our clients. Over the years, acquisitions of some of the top firms and talent in our space have created the perfect blend of services for our clients to employ to further separate themselves from their competitors. 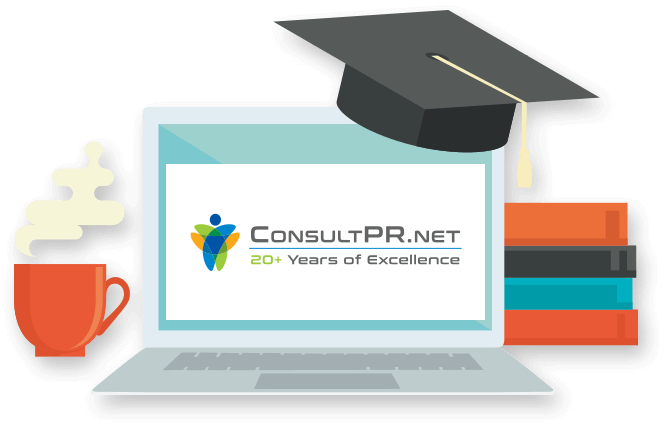 As a result, Consult PR delivers more services and products under one roof to our clients than any other like sized company. Our ability to bring services, once reserved for the largest and wealthiest corporations, to smaller and mid sized clients, has stood us apart from our competition.